It is my understanding from the A&P that the landing gear has a form of hydraulic damping system built in to slowly lower the gear before locking it in place with the leaver. It appears to be a cannister with the fluid in it and causes the pressure on the landing gear so that it slowly lowers rather than just falling and having to lock it in place. Seems to be quite a unique, simple system for something built in the early 40's. The hydraulic dash pot is mentioned in Service Bulletin #1 which I have attached. Keep in mind, I have not yet worked on/seen the system yet, but I have reviewed the technical documents available to me to date and it appears to be shown on page 14 of the Culver Cadet handbook (#'s 52/53/54/55). It's not pressurized, just filled with oil to dampen the lowering of the main gear. I'm sure there are others with actual experience on these airplanes that can chime in with additional details! The device you are referring to is the dashpot. If it's operating properly, it will keep the landing gear from free-falling and banging into the down-stop. The original packing used in the dashpots was notorious for leaking and losing all of the oil. This item is missing from a lot of planes because the owners simply took them off. It's pretty easy to just let the retract wheel slide through your hand to damp the dropping gear. Even it you have a good dashpot, you must still relieve the pressure on the uplock pawl by raising the gear a little, before moving the lever to let it down. After the gear is down, you may have to move it to the full-down position in order to line up the locking pins with the holes. When you're assembling the plane you'll probably get plenty of practice with the plane on jacks. It sounds neat to me even though I hav not seen it. I do have the diagram but seeing it gives a different meaning to me. My project came with the dash pot. I will be at my hangar tomorrow and I'll take a photo and post it. I think one could be made if necessary. Here's a photo of my center section with the dashpot attached. I'll add my two cents to the dashpot... Even if one is installed and in perfect working order it would be DANGEROUS to release the gear and let it fall trusting the dashpot to lower it slowly. I have never seen one I would trust. If it does not snub the fall something is almost sure to let go like the down stop or the push-pull pivot bolt or the "half moon" plate attach bolts. Next?? An unhappy landing because you have a slim to none chance of getting the lock pins in place. ALWAYS hold the wheel and let it slide slowly down!! Why? The dashpot has no o-ring on the piston, just a close fit in the cylinder so it's not very efficient and a little scoring or roughness on piston or cylinder and it's not likely to work well even if just serviced full of oil. As someone said earlier most (if not all) leaked. Just a little air in it and BANG. My project does not have this hydraulic snubber. I have read the various reports of it leaking and not being reliable, however I would prefer to have one installed. It looks like an easy assembly to duplicate which enough information. Is anyoneone willing to disassemble one and make a few shetches or lend me one so I can duplicate it. I am sure I can also come up with a better seal to eliminate the leaking problem. I too would like to have the dash pot. From what little I know, it looks like it would be a simple thing to rig by either putting in an 0 ring or finding a suitable small hydraulic cylinder with the right amount of pressure for this to work. Since this plane is out of production, anything done by standards should be accepted as it is not a critical issue because we still have the wheel. I have a couple questions about the bushings on the landing gear torque links and c-springs. My gear was all disassembled with bushings missing. Are the torque link bushings bronze or steel? And is there a small bushing where they pivot? Are there bronze/steel bushings in the ends of the c-spring ends? Bronze/steel bushings on the lower socket and upper oleo housing? My feelings are similar to Paul's on the dashpots. They aren't very reliable. I feel that you should already have your hand on the wheel to relieve the pressure when you unlock the gear. Even if you have a dashpot, to be safe, you should allow the wheel to slide through your hand to dampen the speed as the gear lowers. By the time the gear gets near the full-down position, there isn't much gravity acting on it. At that point, you actually may have to overcome aerodynamic forces by holding the wheel toward the full-down position, allowing the locking pins to align with the gear. Since your hand needs to be on the wheel at both ends of its travel, you may as well hang on to it and protect the gear. 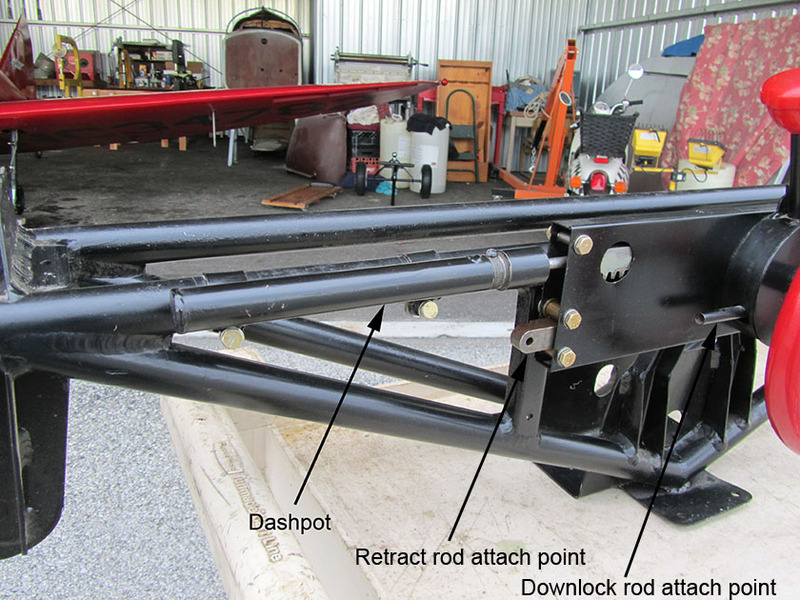 The need to hold the gear in the full down position while engaging the locking pins, probably won’t show up when operating the gear while the plane is on sawhorses. While I only got to try this a few times, my procedure for lowering the gear was: Make sure the airplane is trimmed for level flight. Left hand pulls the top of the wheel to left to release the ratchet while right hand moves selector lever to the unlock position. Move right hand to the wheel THEN move left hand back to stick while snubbing/monitoring rotation of wheel with right hand. Use right hand to move wheel top of wheel to right (against downstop) if necessary. Use right hand to move selector to lock position. I do not recommend the "hold the stick between your legs" method. I tried that a few times and ended up moving the stick (and airplane) all over the place while trying to manipulate the landing gear controls. It's best (IMHO) just to get the airplane trimmed up nice, and let go of the stick for the short time when both hands are needed for the landing gear. When I first got my Cadet, the downstop on the gear was considerably misadjusted. Once the gear was down, I'd have to hunt around for the locking holes by moving the wheel around with one hand while simultaneously trying to move the selector with the other. After the downstop adjustment it was a simple matter of getting the gear to the downstop and then moving the selector, both on sawhorses and in-flight. The dashpot was pretty much empty when I got the plane. After filling it, it didn't seem to make a great difference in the speed of extension. I'm still afraid to let go of the wheel for fear of banging the downstop. After reading everyones response it appears to me that the dash pot was intended as a stop gap measure in case the wheel got away from you? I can see that you don't want to just dump the gear and this would soften the effect of the drop if you dropped it.